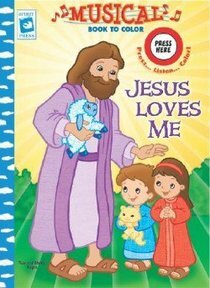 TITLE:Jesus Loves Me DESCRIPTION:Musical book to color. Words to songs included! - Publisher A musical chip plays "Jesus Loves Me" song, adding extra fun to coloring pages. About "Musical Book to Color: Jesus Loves Me"
A musical chip plays "Jesus Loves Me" song, adding extra fun to coloring pages.